Since Mr. Lyan promised the marriage, D z Yun started to prepare for the engagement. The engagement was very different from nowadays. First of all, De Yun must have a matchmaker to present his engagement proposal. He asked Uncle Bu to be the matchmaker to go to the Lyan’s residence to proposed the engagement for him. Uncle Bu was a close friend of Mr. Lyan. He visited Mr. Lyan frequently. At the Lyan’s, Uncle Bu acquainted with Dz Yun. He was of the opinion that Dz Yun was an honest and gentle boy. He understood Dz Yun and Yu-Wen loved each other. He was willing to be the matchmaker. The Matchmaker played a crucial role in those days. Without a matchmaker, there would no marriage. Step 1: For the boy’s side — he should have a matchmaker who should know both persons well and willing to be involved with this engagement. Step 2: First of all, the matchmaker should bring a piece of red paper with the boy’s birthday and eight characters of a horoscope to the girl’s parents and an engagement ring. The girl’s parents will take boy’s birthday and eight characters to a fortuneteller to be checked to see if this boy’s date of birth and eight characters of a horoscope would match with their daughter’s. If there is no problem and also they think this boy may be an ideal son-in-law to be, they would accept the ring and the red paper. In return, they would give their daughter’s birth date and eight characters of a horoscope to the matchmaker to bring to the boy’s parents. The boy’s parents will do the same as well.
. Step 3: After everything was OK, the matchmaker would prepare two pieces of formal “Big Dragon and Phoenix Card” for each party. Those Cards carries both boy and girl’s birth dates and eight horoscopes. The one for the girl’ parents was printed with a pair of Phoenix on the very right side of the card. The one for the boy’s parents was printed with a pair of Dragon on the left side of the card. These “Big Dragon and Phoenix Cards” were really big! They were about one foot long and three feet wide solid red silk cloth framed with gold thread. Until both cards were accepted, the marriage ceremony is awaiting! By now, if any of the two party refused to accept the big red card, the engagement is canceled. There will be no wedding! Yu-Wen valued the Small Card and the Big Dragon and Phoenix Card so much. Because of the war, her family moved from place to place. The lost many valuables but these two cards always with her. 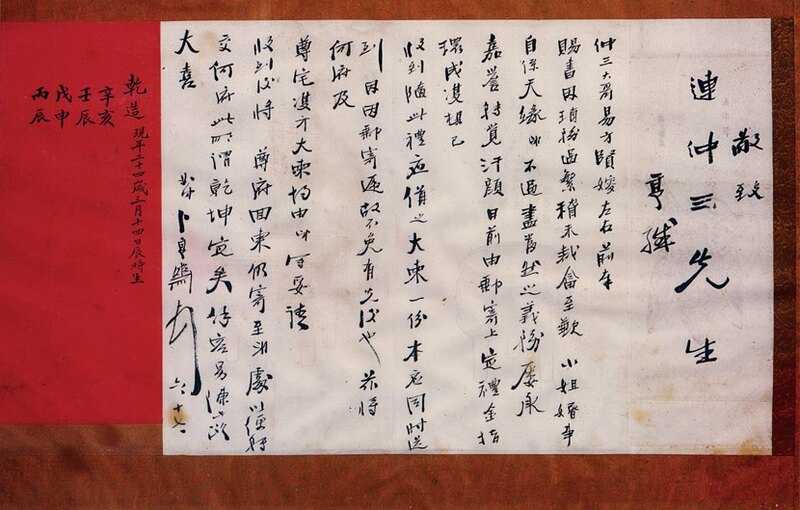 Until they settled down in Taiwan, She hung them on the wall in her bedroom by her bedside. Along with her mother-in-law’s portrait. The person who loved her so dearly! Mrs. Lyan started to seek for a matched marriage for her only daughter. But each time Mrs. Lyan thought she found a matched one was declined by Yu Wen’s father. He thought that it was still too young for Yu Wen to get married. Besides Yu Wen was their only daughter it’s too early to let her go. And he thought they should be very careful to pick and choose a good son-in-law for it matters Yu Wen’s whole life. Mr. Lyan was proficient at mathematics, physics and chemistry. As a director of an arsenal, many young scholars, professors, celebrities came to visit him. One day a young man, he introduce himself as Ho Dz Yun, a student from Peiking University, wish to see Mr. Lyan. He said that he had been admiring Mr. Lyan’s great attainments in physics and chemistry for quite a while. He would like to ask him for some advice. Mr. Lyan was out going and informal with everyone The conversation he had with this young fellow was pretty delightful. The Math problem that this young man brought up, Mr. Lyan gave him the answer right away. In return Mr. Lyan’s gave him some math problem. Young Mr. Ho couldn’t answer it. He was very embraced and blushed. And finally he gave up! Mr. Lyan found himself was very fond of this young visitor, specially for his talent. He said kindly to him:”It’s OK! It is a little difficult. How about this way, you take this problem home today and think it over again. Come back with the answer some other time.” Thus Ho Dz Yun became a frequent visitor of the Lyan residence. He addressed himself as ” Mr. Lyan’s student”. Mr. Lyan loved to make new friends, especially with this young man. But Mrs. Lyan didn’t like him at all. She called Mr. Ho “Young Idiot “. Because it seemed that he knew nothing other than mathematics, physics and chemistry. Once while Her husband were talking with this” Young Idiot “, she saw him was clapping and jumping like a happy child! He had no aristocratic bearing at all. But the fate often surprising people. Since “Young Idiot” Ho Dz Yun visiting Mr Lyan frequently, he notice that Mr. Lyun had a lovely daughter. Mrs. Lyan’s comments of this “Young Idiot” brought up Yu Wen’s attention. This visitor of her father. Actually Yu Wen found that Ho Dz Yun was not a Idiot at all. He is very knowledgeable in many fields. Other than those what-so-ever he was discussing with her father Yu Wen didn’t understand, Ho Dz Yu was quite erudite as well as in Chinese ancient culture. Sometimes Yu Wen even heard Dz Yun hummed some Chinese opera. Yu Wen speculated that it could be because this young man is a student, his attitude and dressing was so different from those profligate sons of blue blood whom her mother introduced to her. Dz Yun never greased his hair. his shoes were not shinny polished but always in a good condition. He always wearing a blue long Chinese robe, neatly clean. The whole being Looked elegant and gentle. Yu Wen thought Dz Yun was special! Yu Wen was not only Westernized in knowledge and thoughts as well as. Advocate the freedom to choose one’s own marriage. She was not in favor of those her mother introduced to her. For if they were not overcautious on behalf of maintain their nobility or they would be swollen with arrogance. Dz Yu was different!